This morning, Jonah finally recovered from the three-day, school trip and stopped talking in the Peewee Herman voice that he picked up from the ADHD kid in his cabin, which is a good thing, because I was hoarse from yelling at him to knock it off. And I'm not guilty about it at all. We had to clean the house this morning. 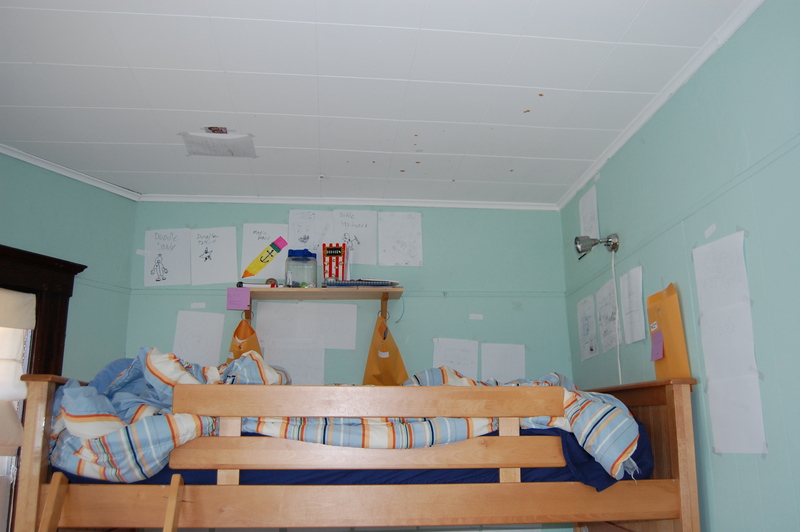 All the crap from the field trip was still strewn about the house. The cleaning lady was coming at 11:00. In order for her to vacuum and dust, all the crap must be put away. Cleaning for the cleaning lady is slightly insane, but that's my life. I really should cut out the cleaning lady. She was brought in when I was truly desperate with work and the kids. I'm not so desperate now, but I've been dragging my feet on this one. She only does the common areas and the bathrooms every other week, so it's not a huge cost. And it's really nice to have the entire house clean simultaneously. It's amazing how I'm able to rationalize just about everything. I put the kids to work straightening up their room, and I tackled the bigger mess in the kitchen. After the kids put away the monopoly board and the trains, Ian decided to draw and Jonah joined in. 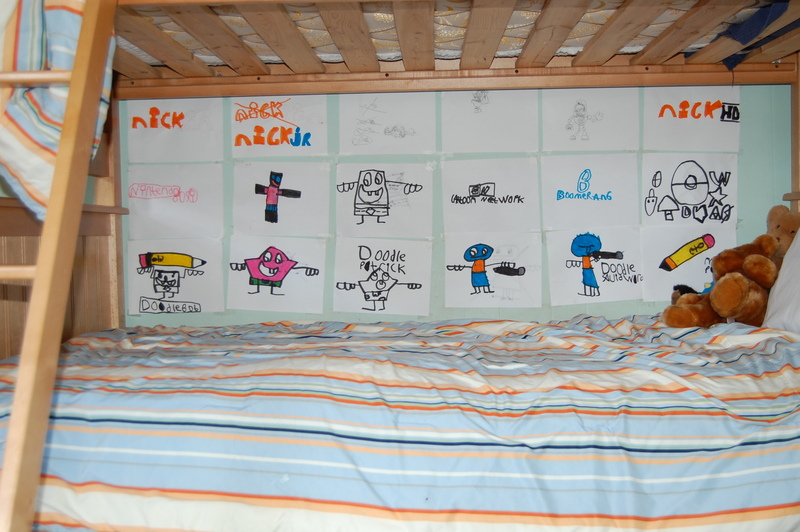 Ian set up this wonderfully arranged art gallery over his bed all on his own. Jonah's effort was more expansive and less neat. Their brains are wired differently. We're going to drive into the city in an hour. We'll park around Times Square, take the subway to Museum of Natural History, and meet up with Steve at his office at around five. His office is their idea of heaven. They'll go in through the whirly doors into the massive marble lobby. After security lets us in, we'll take the mirrored elevator to the floor where he works. It's a football field of desks and computers and ergonomically engineered chairs that spin around. Steve will show off his boys and then we'll go to Virgil's for dinner. I just hope that we don't get mired in the traffic coming back from the Yankee parade. I'm slightly antsy, because the kids' school vacation threw me off my writing groove, but the house is clean, Jonah's teeth have been moved closer together, the boys have an art gallery, and I'm getting barbecued ribs for dinner. It's all good. Don’t cancel the cleaning lady. They perform an admirable service in keeping things in check, b/c if you didn’t clean for the cleaning lady things would pile up that much higher before you got around to actually putting stuff away. Also, having a cleaning lady prevents procrastination cleaning when you should be doing other stuff. Wait until after you finish the book. I’ll third the cleaning person, if you can afford it, it’s a mind-saving extravagance. V. jealous that you are a mere train ride away from Manhattan! I’m a mere train ride from Manhattan. Just a very long uncomfortable one. “Cleaning for the cleaning lady is slightly insane” — nope. One reason I’ve had a cleaner come in is that it serves as a motivator for me to get done what I can do, that I wouldn’t want to pay her to do. In other words, I want to pay her for doing the stuff I dislike, rather than the stuff I procrastinate on. Plus having a cleaning person has always helped me with a schedule. Oh, Cleanera is coming on Tuesday = strip the beds & start the bedlinen laundry Tues am before school starts. Hiring a cleaning person is the socially right thing to do. You are providing a hard-working lower-income business owner with a job, and helping that person to contribute to society. If people didn’t hire these small business owners, mostly women, to clean their homes, those women might be dependent on government programs and charity. In some poor countries, it’s considered extremely selfish not to have a housekeeper if you have the money. Congratulations for doing your part for the economy!